We’re all winding down a bit from Thanksgiving. We’ve done the Feast. 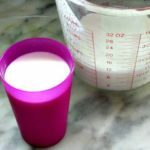 It was rich and meaty, there was gravy and whipped cream, we had another day or two of leftovers (with gravy and cream) and – it’s time for something simpler and less rich. I ended my CSA season with a full refrigerator. 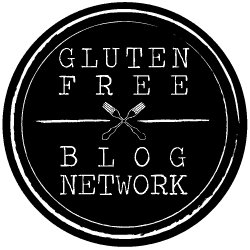 If you follow Inhabited Kitchen on Facebook, you saw the pictures of our pickups. 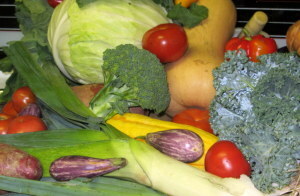 By now – three weeks after our last pickup, the last tomatoes are long gone, and the eggplant and kale is cooked and either eaten or frozen – but my crisper drawer is still full of cabbage and winter squash. As a cook, I really like cabbage. 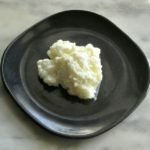 It keeps well, I don’t have to worry that it will turn soft between one day and the next, it is very easy to cook, and it is versatile. Fortunately we like the taste, too! You can always just boil it… When I was a child, my mom would, very occasionally, buy a small cabbage, cut it in wedges, simmer them, and serve them with butter and caraway seeds. And I liked that. 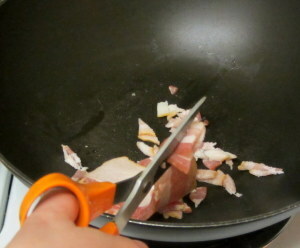 More often, though, I chop it and saute it – usually with flavorful fat (such as bacon) and/or seasonings. 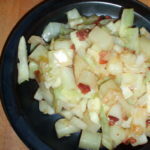 Looking over last year, I realize you’re going to think I always cook cabbage with bacon! 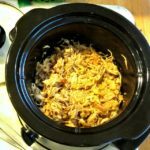 (Or at least, some sort of pork…) That’s not quite true – but it really is a good combination – the smoky savory bacon with the milder cabbage. It’s always optional, though. 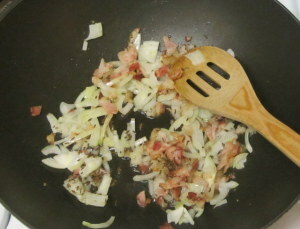 Then I sliced a small onion thin, and added it, and half a teaspoon of caraway seed. (I have a mortar and pestle, and crush the seed lightly to release flavor. If you can, do, but for years I did not, and it still tasted good. 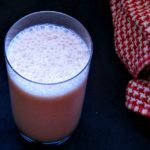 I don’t buy ground spices, usually – well, I’m not even sure if I’ve seen ground caraway, but they all start losing flavor as soon as they are ground. Go for whole when possible.) After the onion had softened, I put two cloves of garlic through a press, and stirred it in – it’s added late so it won’t burn, which makes it bitter. Meanwhile, I chopped the cabbage. 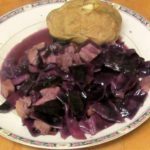 I’m only cooking for two, so I never cook a whole cabbage at once – I cut off a slice or a wedge from the side, and then chop it, putting the rest back in the drawer. If I can cover the cut edge with an outside leaf that helps keep it fresh – if I need to, I later cut off and discard a paper thin slice that has dried out, and the rest is good. Normally at this point I would serve it as it. 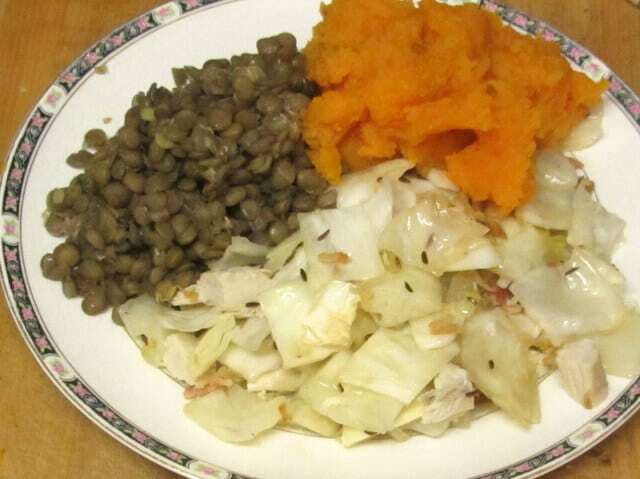 In this particular case, I was serving it with some lentils, and wanted to add just a little meat to increase the protein – bacon alone really isn’t much protein, just flavor… So I shredded in a bit of the cooked turkey I’m still working on, and stirred that around just until it was completely hot. It’s just a slight variation on a plain sauteed vegetable, but it adds a lot of flavor. 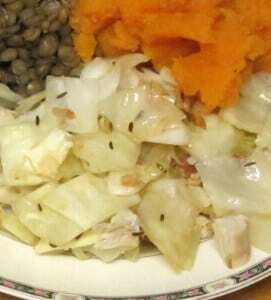 We had it with some simple and earthy lentils, and sweet mashed sweet potatoes, for a nice change from the rich turkey meals. 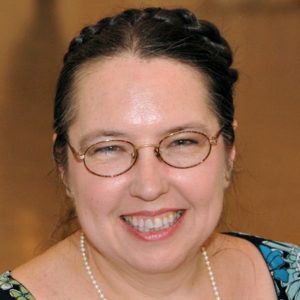 Winter is coming – I’m even starting to listen to Christmas music! – and the winter vegetables just feel right. (I do still have one green pepper, though – for a last, treasured taste of summer! There was a sudden warm spell right before the first frost, and our farmer made the most of it, sweeping up everything that ripened or grew unexpectedly.) I’m settling into soup for lunch most days. 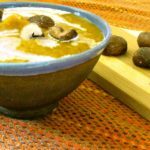 And so also with the Inhabited Kitchen – we are moving from salads and light vegetable dishes to heartier meals with long simmering blends of flavor, following the seasons. 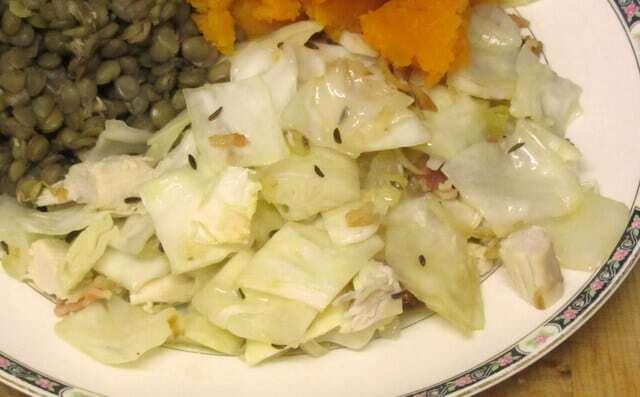 A simple sauteed cabbage with bacon and caraway seed - a classic winter vegetable dish. Cut the bacon in small pieces, Put in frying pan over low heat for about 10 minutes, until fat is rendered out, and meat is just beginning to crisp. Chop the onion. Add it to the pan, with the caraway seed. Saute until soft. Add the garlic. 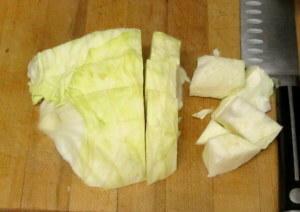 Cut and chop the cabbage coarsely. 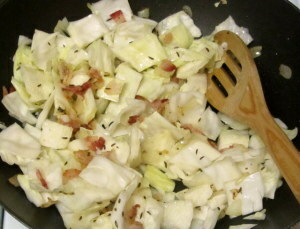 Stir in the cabbage, to coat it with the bacon fat and seasoning. 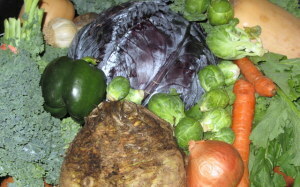 Cover the pan, and put on low heat for 10-15 minutes, until the cabbage is cooked to taste.